Hemp is no longer a complete novelty — but it isn’t exactly mainstream either. It occupies the somewhat risky middle ground of being better established, but still niche. There’s plenty of interest in growing it, but that capacity could swamp markets that are still developing. Market research by Manitoba Harvest, one of the province’s major hemp processors, showed less than three per cent of Canadians and less than one per cent of Americans have tried hemp-based foods. Hemp acres have risen dramatically, but not steadily, in Manitoba since the crop was legalized in 1998. From 2001 to 2006, industrial hemp acres in Manitoba jumped from 1,300 to 30,000, according to Manitoba Management Plus data published by Manitoba Agriculture. The crop hit a roadblock the following year however, and continued to fall, bottoming out in 2008 at 2,500 acres, before starting to recover. By 2013, the Manitoba Agricultural Services Corporation recorded 11,300 hemp acres (although Manitoba Agriculture estimates hover closer to 14,700 acres), a number that rose to 17,450 acres in 2014. 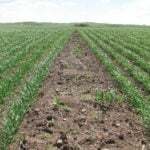 Seeded acres took a hit in popularity last year after Manitoba Harvest announced in December 2015 it would cut off new contracts in 2016 because of a glut in seed. The Manitoba Agricultural Services Corporation reported 14,500 hemp acres in Manitoba last year, down from 21,200 in 2015, according to variety market share reports. Manitoba Harvest opened up contracting again this year, but Saunderson says oversupply is still an issue due to international markets and yields, which Clarence Shwaluk, Manitoba Harvest director of farm operations, estimates have jumped from 600 to 800 pounds per acre to over 1,000, as farmers have become more familiar with the crop. “We used to manage our production contracts based on a certain pound-per-acre average, and those almost doubled within the last few years, so right away, even though we’re contracting less acres, those acres are producing yields that we haven’t even seen before,” Saunderson said. 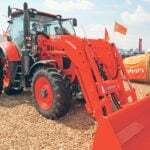 New varieties have also bolstered yield. 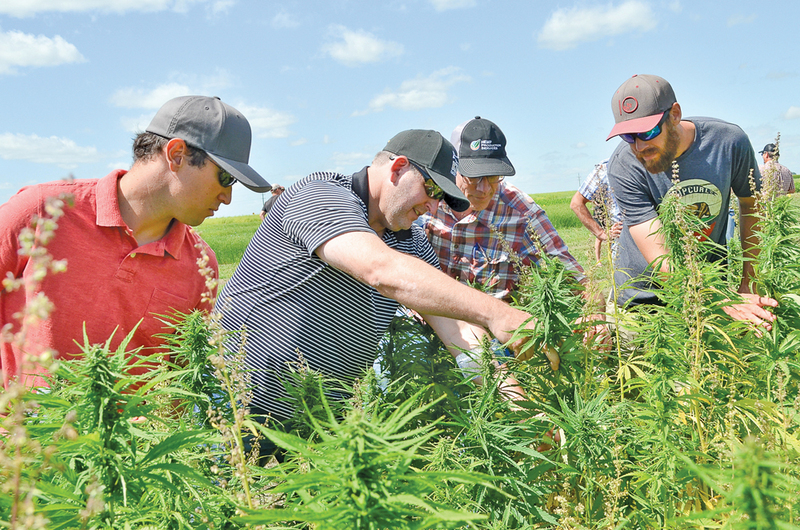 Field tour attendees in Melita July 25 take a closer look at emerging hemp management practices. 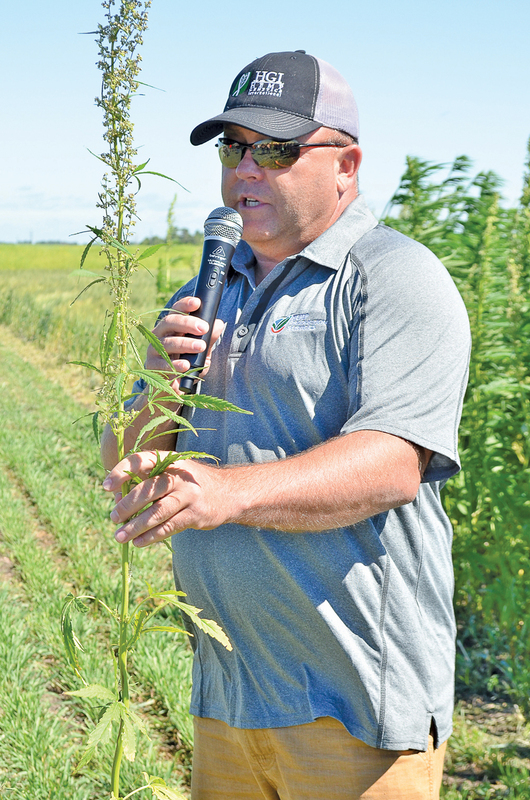 Jeff Kostuik, central region director of operations for Hemp Genetics International, cited new, shorter varieties designed to maintain yield while minimizing residue — a noted problem with the bushy crop — and limit shelling loss due to wind. 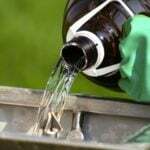 His company is also developing more herbicide-tolerant varieties. Kostuik estimates that yields could reach up to 1,600 pounds per acre given current variety and agronomic advancement. Internationally, Canadian hemp value is in flux as the South Korean market slows. The industry heralded the Asian country as the next great market last year, after Koreans unexpectedly tapped hemp seed as an alternate protein source to fish, which some had lost their appetite for in the wake of 2011’s nuclear incident in Fukushima, Japan. A home shopping program launched hemp into the limelight in late 2015, and by mid-2016, companies across Western Canada were scrambling to meet demand. That peak has since tapered off, Saunderson said, something experts have blamed on increased competition from countries like China. Prices have since lowered in South Korea and other Asian countries. With the decline in Asian markets, companies like Manitoba Harvest are turning to places like Japan or Australia. Australia and New Zealand will join the hemp foods market for the first time this fall, after their governments ruled to legalize hemp for human consumption in April. “We anticipate that that’s going to be a big new market,” Saunderson said. The hemp industry may face another competitor in years to come, however, as U.S. interest in the crop heats up. Thirty-two states allow hemp to be grown commercially, in pilot programs or for research and legislation to loosen regulations around the crop was introduced to U.S. Congress in July. Producers have noted the ongoing market challenges. The perspective was echoed by fellow hemp grower Bryce Cowling. “(It) just needs more consistency on movement and marketing,” Cowling said. 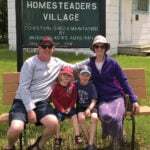 Gerrard further advocated hemp coming under the Canadian Grain Commission umbrella. Saunderson, however, was wary of that prospect, arguing that the market, while it shows potential, is not yet well enough established. Hemp’s emergent status leads both Saunderson and Kostuik to warn farmers against growing the crop without a contract. The hemp game in Manitoba may be ready to shift with the promise of two processing plants to open in Gilbert Plains. Lyall Bates, owner and president of HempSense, says his dual-purpose plant is in the final stages of setup. Grain processing will begin within two weeks, followed shortly by fibre processing within the month. The facility is undergoing organic certification for hemp grain. “We looked at (hemp) about eight years ago when the farmers came to me and asked me if we could get something going,” Bates said. The interest soon took Bates on a tour of Europe’s hemp facilities, but he was unimpressed with the economics of textile-grade hemp. Many plants were struggling, with some going into receivership as companies struggled to meet the textile industry’s high standards, he said. Instead, Bates turned to other uses for hemp fibre, and developed a product list that includes kitty litter, floor cover for absorbing oil spills, garden mulch and animal bedding. “This is a starting base for us. We feel that we can start with these products and then we can go into some other products later on,” he said. The plant is not yet open, but bale shipments from as far away as Edmonton have already arrived and HempSense has organized trucks and balers for contracted producers who lack proper equipment. The dual focus on both grain and fibre makes the plant a rarity in the Manitoba hemp industry. Kostuik said it would be possible to reap the benefits of both fibre and grain production with a single crop, assuming farms are within reasonable distance to fibre plants. Most hemp production in Manitoba is grain based for hemp foods, Kostuik said, although marketing fibre may be a boon to farmers, due to the difficulty of otherwise managing field residue. The long-awaited — and long-delayed Plains Hemp plant will hopefully follow HempSense next year, according to Manitoba Agriculture representatives. Equipment is running and being tested on site, the Manitoba Co-operator has been told. The plant was met with optimism when it was first announced in 2010. Both federal and provincial governments threw support behind the project, announcing $5.3 million in funding, $4.775 million of which was federal. At the time, owner Robert Jin predicted a quick opening to the plant. Construction of the building wasn’t completed until 2013, however. The plant was delayed again in 2014 after a worker was seriously injured, losing part of his arm. The company was later fined $20,000 due to the incident. As of June 2016, the company was said to be updating electrical wiring inside the plant. The fibre-focused Plains Hemp plans to offer a range of fibre quality products ranging from animal bedding and floor absorbent to barbecue pellets and “hempcrete” building material. Despite having both plants in close proximity, Bates says he is not concerned about competition. “There’s enough acres out there and we can contract with our own farmers to take the seed and the straw, enough to run both plants,” the HempSense owner said. Plains Hemp did not respond to requests for an interview.